Servindi, March 19, 2018.- At the end of March, Peru should send the final version of the Implementation Plan for Phase II of the Joint Declaration of Intent (JDI) to Norway, following a series of multi-actor technical meetings that contributed in the analysis of the gaps and risks and the possible activities to prevent these. This agreement, signed in 2014 by the environment ministries of the Governments of Germany, Norway and Peru during the United Nations Climate Summit, aims to contribute to reducing greenhouse gas (GHG) emissions from deforestation and forest degradation, and contribute to the sustainable development of Peru. In October 2017, the National Forest Conservation Program (hereinafter the Forests Program) made two documents available to be delivered to Norway through the International Forests and Climate Initiative (NICFI). The first one was the Report on Compliance with the Progress of the JDI until 2017. As the name indicates, this document collected the goals reached until 2017 in the Preparation phase. This report was delivered to Norway in November 2017. The second document that was raised for public consultation was the Implementation Plan for Phase II of the JDI, which presents the strategies that Peru would follow to meet the objectives of this phase to Germany and Norway. 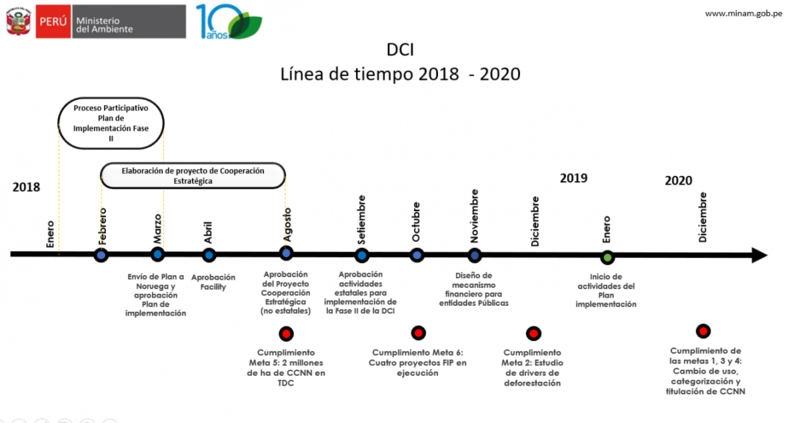 It should be noted that the consultation process on this point began during March and April 2017 with decentralized workshops in Lima and in the Amazonian regions involved in the JDI. In October, the first version of the plan received various comments and observations that required a detailed review of each deliverable, that is, of each goal to be reached and their respective strategies. Between December 1 and December 5 the plan was discussed again, this time with the participation and comments of a delegation from the Norwegian Government. The result of the public consultation during 2017 led the Forests Program to consider a second consultation process. After reviewing the first proposal, a new work scheme on the design of the implementation plan was presented in January 2018. Incorporate comments from indigenous organizations, civil society and Norway's comments to the first version. Deepen the analysis of gaps and risks. Deepen the design of interventions. The second task consisted of determining the gaps that exist between a regulation and its implementation, as well as identifying what risks exist or could arise. On the other hand, the third task was to prioritize what activities or interventions necessary to "close the gaps" and mitigate the risks detected. The appropriate entity began the process for the plan’s participatory preparation during February 2018, dividing it into two stages corresponding to the tasks previously described. Organizations and sectors involved were then summoned to a series of bilateral meetings and two rounds of multi-actor technical roundtables. 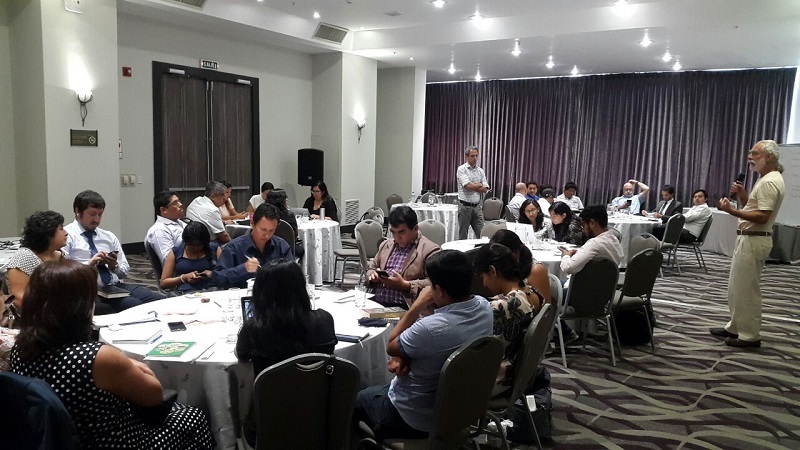 The nature of these meetings required the participation of officials from the regional governments of Amazonas, Loreto, Ucayali, San Martín and Madre de Dios, as well as representatives of SERFOR, SERNANP, MINAM and MINCU. Likewise, representatives of indigenous organizations, such as AIDESEP and CONAP, and civil society organizations, such as DAR, IBC, ACCA, CEDIA, Servindi, among others, attended. The technical roundtables focused on the fulfillment of deliverables 1, 3 and 4, since the rest of the results will be achieved during 2018, according to the JDI Team estimates. The first round of technical roundtables was held between February 12 and 14. The second one, between February 27 and March 1. It is expected that the activities for the aforementioned deliverables begin in January 2019 and that they have a compliance term until December 2020. Regarding the previous phase of public consultation, this has had a better performance in terms of convocation and procedures. The presence of regional governments, indigenous organizations and civil society in the six technical roundtables was one of the achievements of the most recent participatory process of the JDI due to the few spaces of multilevel articulation that currently exist. However, although the design of the methodology was objective, the duration of the discussions about the gaps (first stage) and the interventions (second stage) were not enough. But not all the weight falls on the competent team. The gaps between a regulation and its fulfillment are, in most cases, so wide that they cannot be solved in a technical table, even less if there are no articulation spaces or the public entities’ political will involved in the conservation of forests. In that sense, the Phase II plan should be precise and strategic enough to define deadlines and activities and an adequate distribution of the budget to achieve the goals of the JDI until December 2020. On the other hand, the discussion about the gaps was the moment when more concerns arose. In the case of deliverable one, the infrastructure and connectivity gaps hamper the operation of an information system on the applications for authorizations to change land use in the Amazon. In addition, the concerns also include the lack of efficient management tools and the need to improve the capabilities of the personnel involved in these procedures. The third deliverable, the outstanding issues were discussed such as the lack of complementary studies and the relevance of the prior consultation process for the categorization of preserved areas, the necessary improvements in the territorial categorization management and the need for reliable and updated sources of information. Likewise, in deliverable four, some of the points were: the overlap of communal property titles with Permanent Production Forests (BPP); a database on the demand for titling of native communities; the coordination with the National Superintendency of Public Records, among others. While March finishes its first fortnight, it is expected that the new Phase II Implementation Plan of the JDI will be made available to the public before its delivery. According to the organizers of the technical roundtables, the document will be available for comments and after its presentation to Norway there will be no change or extension. Piden al Estado resarcir su deuda histórica de titulación con los PP. II.